The owner Francesco Illy comes from the famous Espresso Coffee Illy family. You can find this coffee brand all around the world. 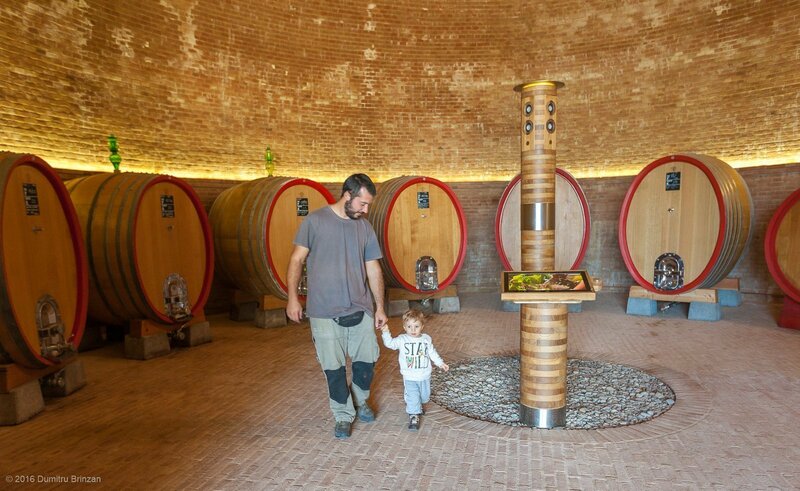 It took Francesco over 10 years to find a suitable place in Montalcino to start his own wine estate. The choice naturally fell on an untouched and wild area that was used by animals for grazing. 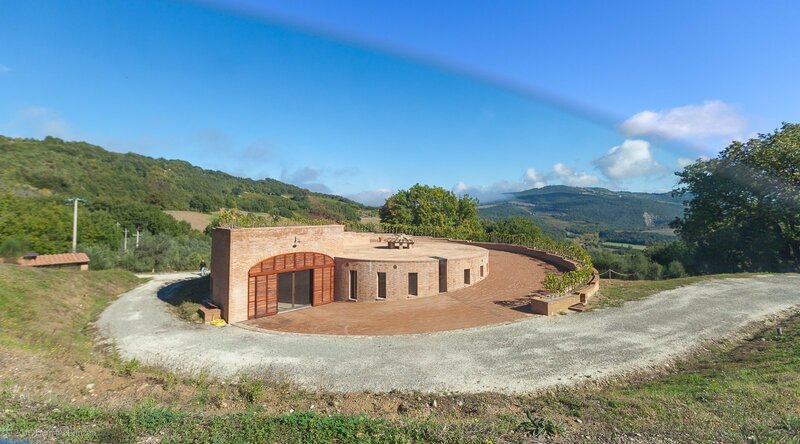 Podere Le Ripi is Biodynamic (a level above “organic”) since 2010. 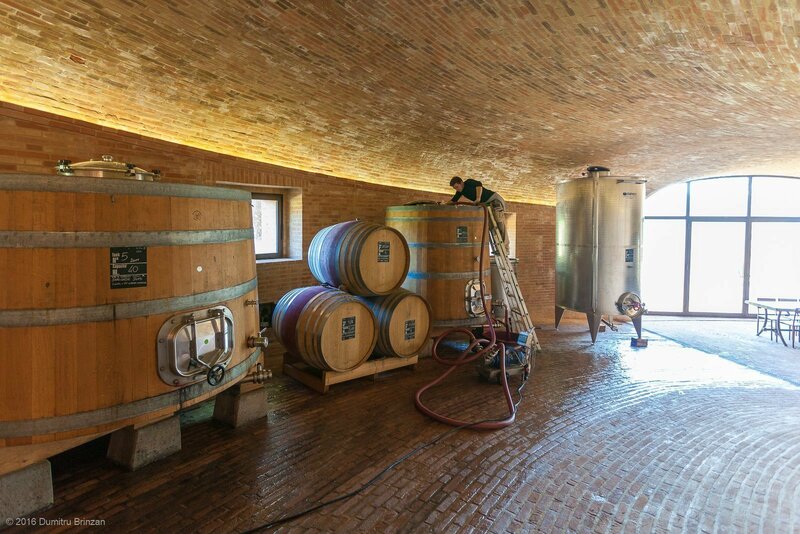 To me, Biodynamics, is nothing else as the old fashioned way our ancestors grew plants and made wines for thousands of years, before the modern methods took place. 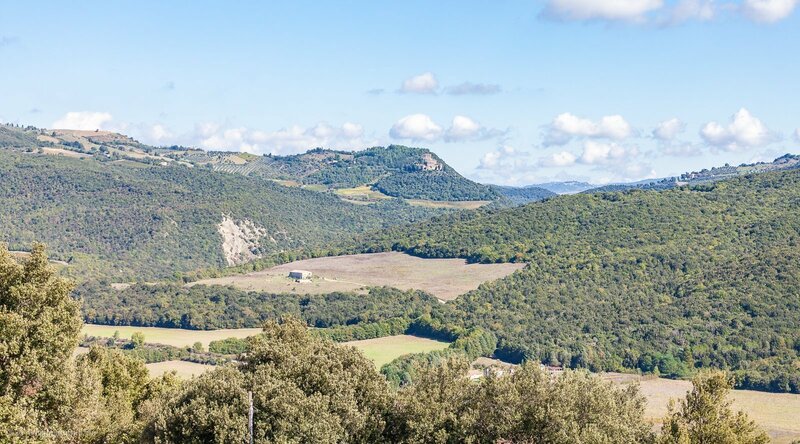 For this reason the soil treated biodynamically is very similar to the soil of a woodland and very different from a conventional agricultural soil. It is less compact, contains a great amount of humus and shows an incredibly strong and complex inner life, from worms to bacteria as to any vegetal and animal biological activity. 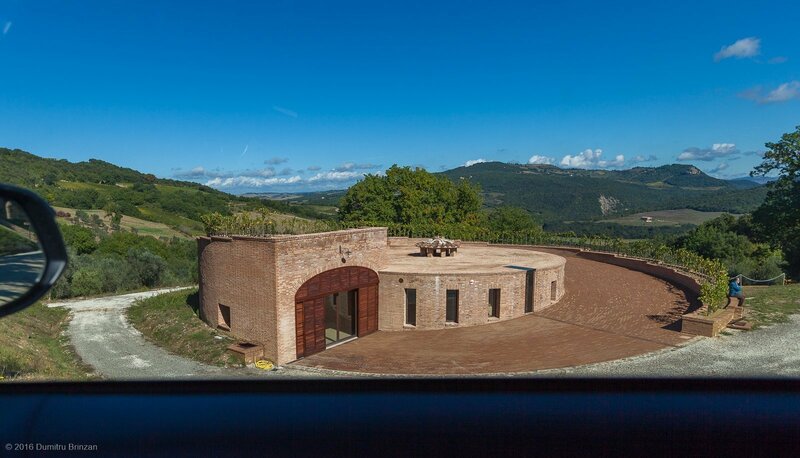 When he started this winery Francesco Illy was told that really good wine can be made only from vineyard that is at least 35 years old. The prospect of waiting for 30+ years (while in his fifties) did not discourage Francesco but instead pushed him towards a crazy experiment. 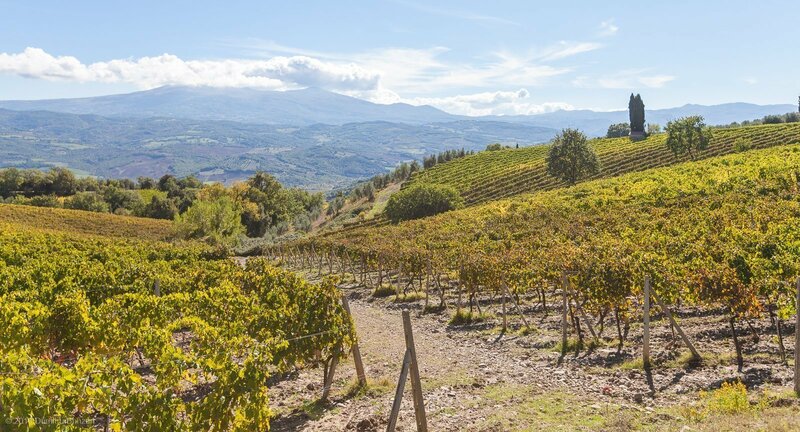 A general rule of vine planting says that it is advised to plant higher densities in poor soil, unless you have a shortage of water in the region. The less water there is, the lower the density should be. 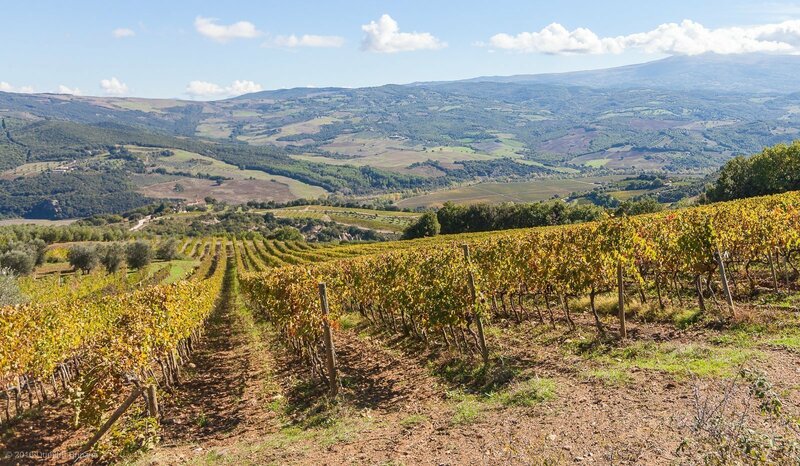 Most vineyards in Europe have a density of 3,000 – 8,000 of plants per hectare. Back to Francesco Illy. 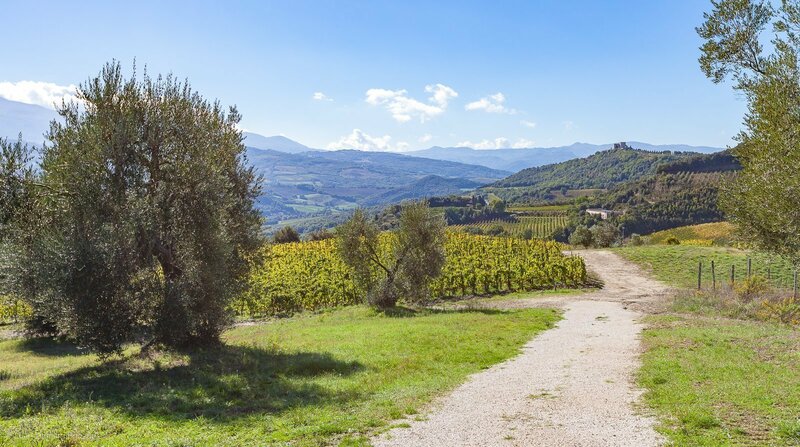 When they began planting in 2000 they started with Sangiovese at 5,000 plants per hectare. 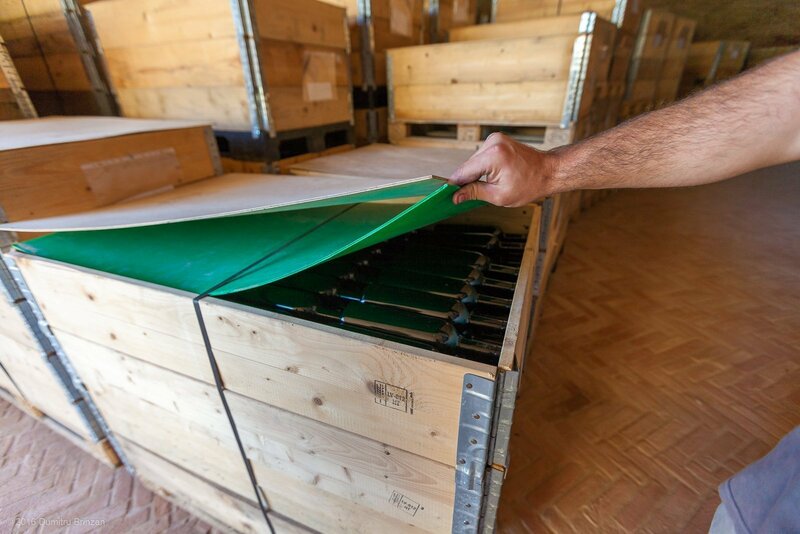 In 2002 to increase the quality of the grapes Francesco tried a density of 6,666 plants per hectare and in 2003 11,111 p/H. 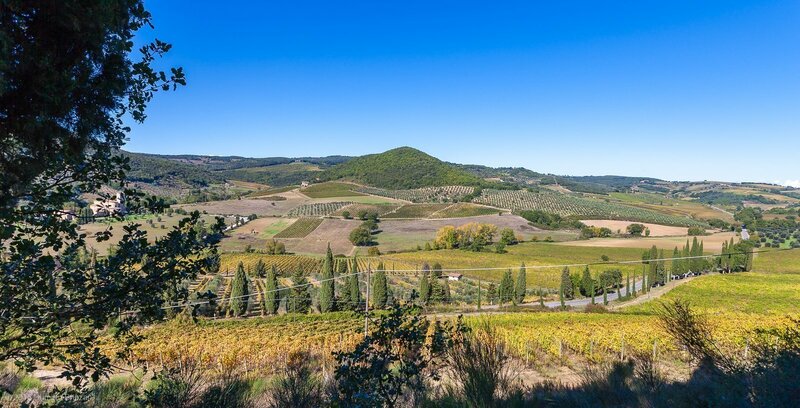 In 2005 Francesco decided to go all out and planted a tenth of an acre with a density of 62,500 plants per hectare. 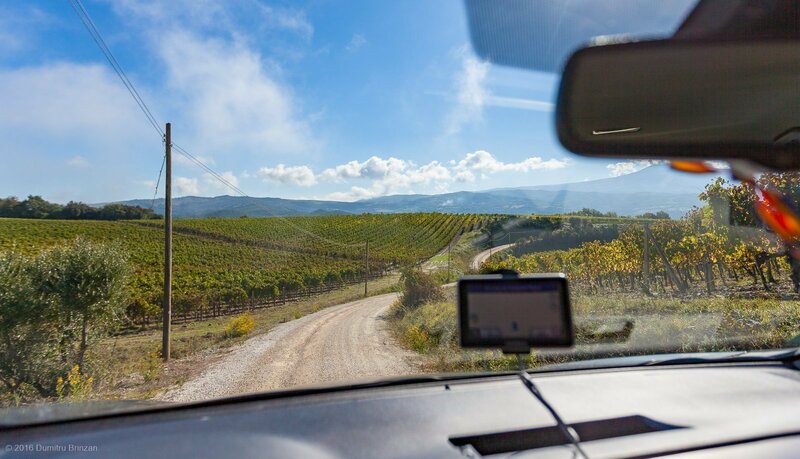 The logic behind this experiment is simple: more dense vineyards push the plants to fight and complete for available resources, which makes their roots go deeper – quicker. Deeper roots mean that they go through more layers of soil and compositions, so the wine quality should increase. We gave every plant a thin support pole of acacia and we grew the vines with goblet vine training system, called in Italy “alberello” and meaning literally “small tree”. 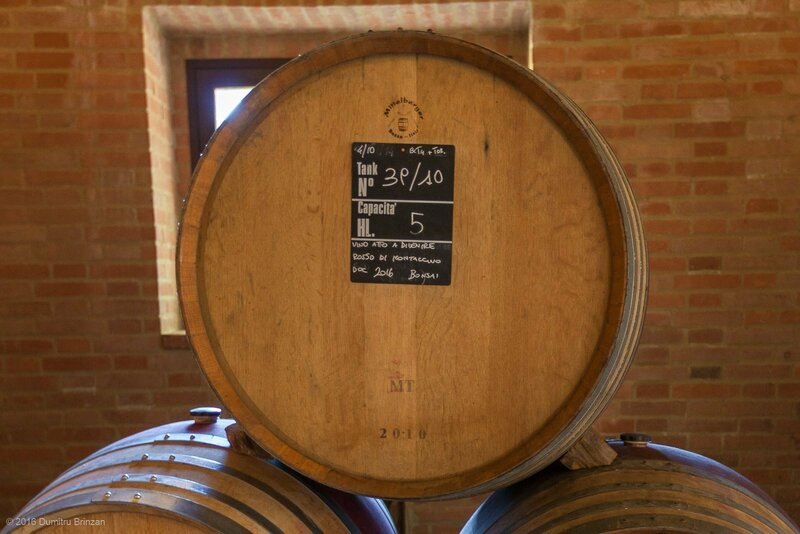 Two and a half years later, with their third bud, they made the first barrique of wine, the Bonsai Sangiovese 2007. The Bonsai experiment, started in 2005, was a tenth of an hectare and the production was roughly 3.300 kg per hectare from the very beginning! 1. 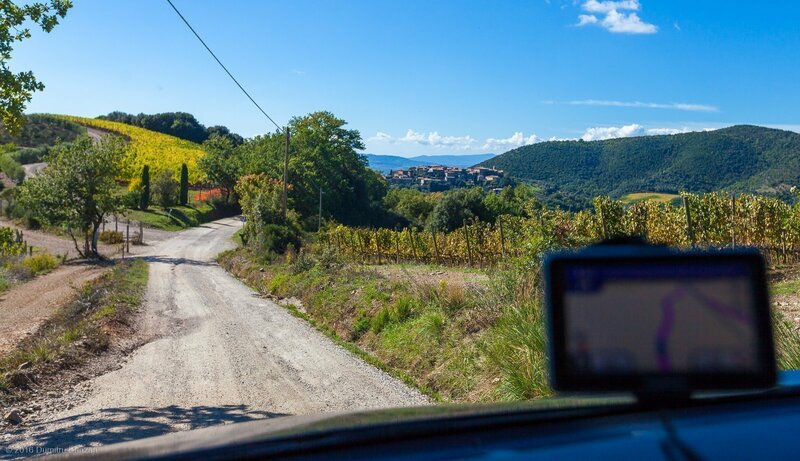 Just like with many other wineries in Italy, the experience starts with a gravel road. 2. The sights are wonderful and the road is in good condition. 3. We enter the gates and on the left we see the unique Golden Cellar. I will talk about it below. 4. 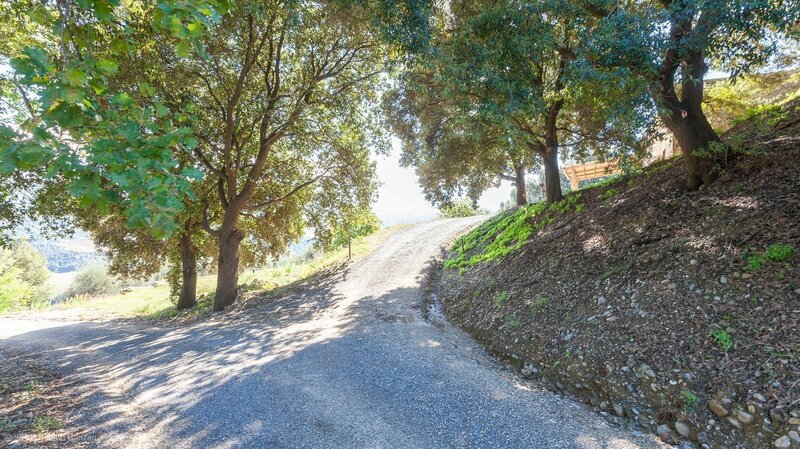 This path takes us to the reception – tasting room and the main viewing point. 5. 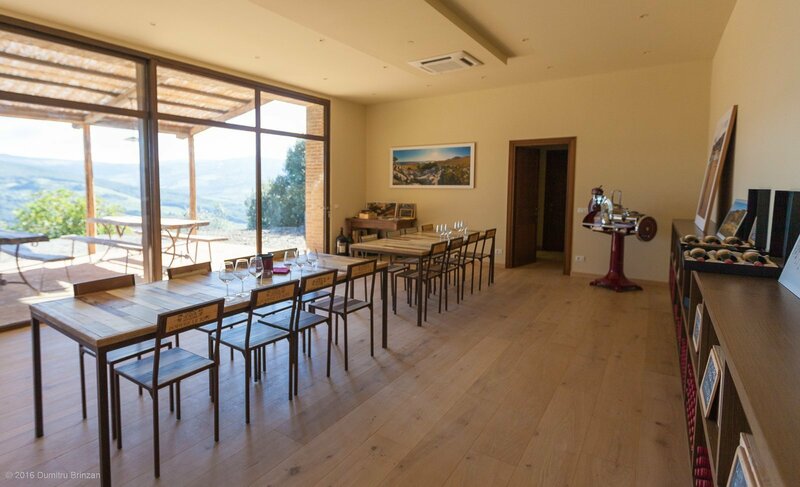 The tasting room is simple and modern. 6. We begin our tour with a quick walk in the vineyards. 7. 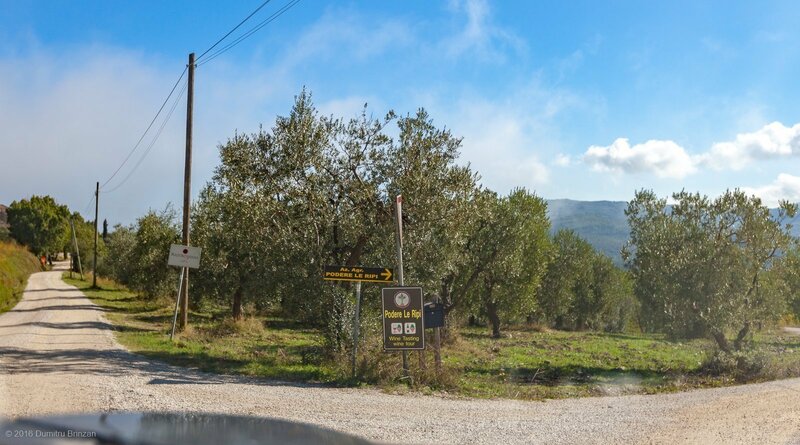 These olive trees have been here long before the winery has been established. 8. 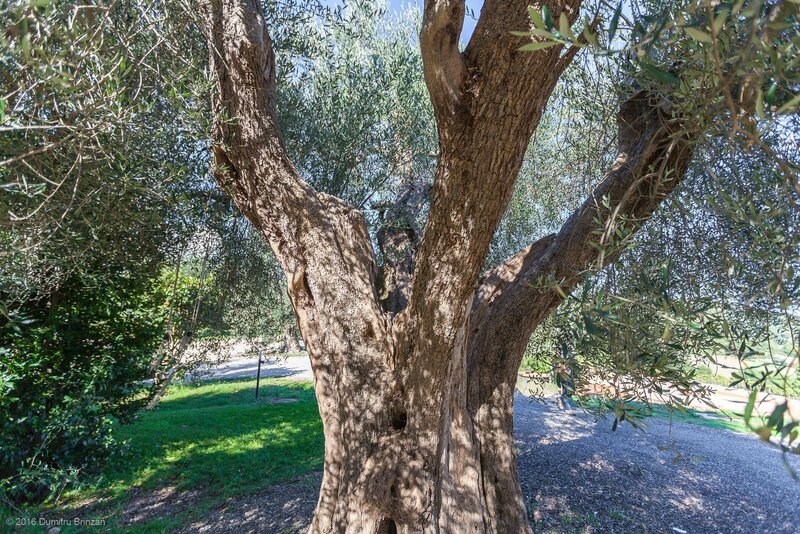 This olive tree is estimated to be over 200 years old. Even my 16mm ultra wide lens can’t fit it all in a shot. 9. Let’s go and take a look at the Golden Cellar. 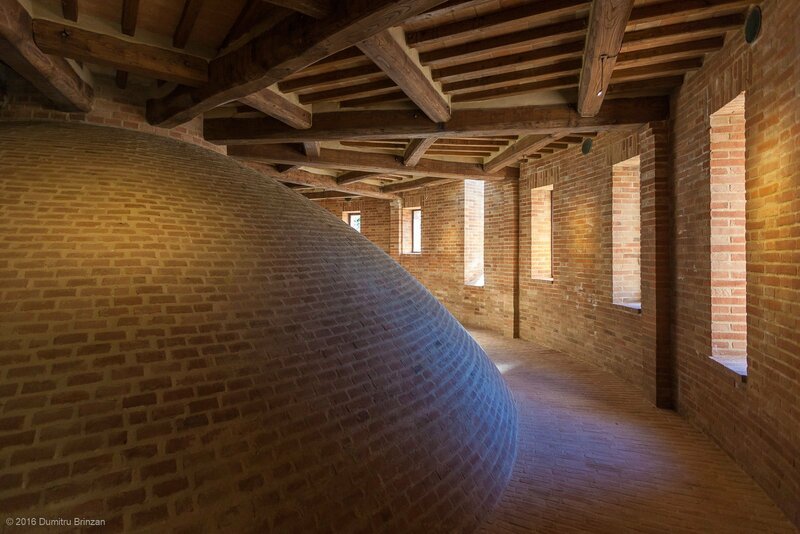 A cellar only built using the ancient construction techniques. 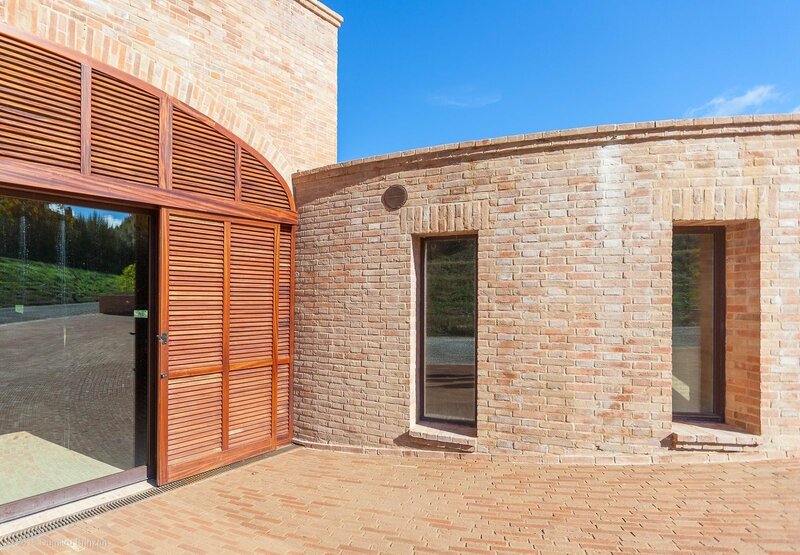 From the relations among spatial dimensions, strictly in the Golden Ratio, to the use of natural clay bricks and a mortar made of lime: this building chases harmony to be given to the wine which gets refined here for the first years of its life. 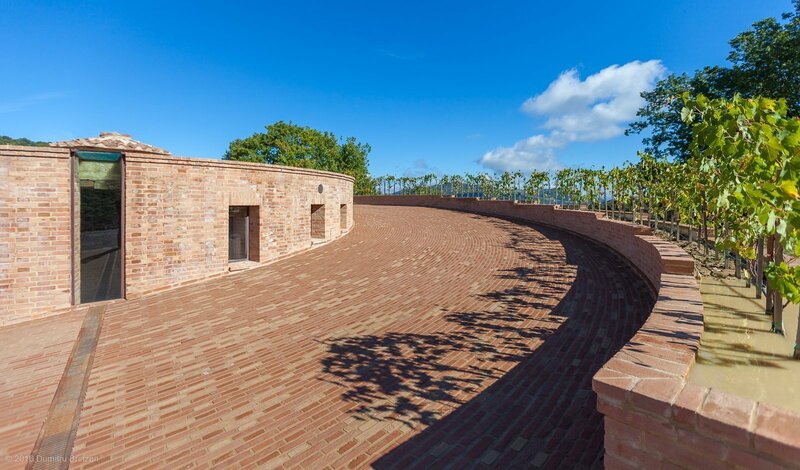 It took 7 years to design and develop, 1 year to get it approved and then over 4 years to manually lay the 750,000+ bricks that were used to construct it. No iron scaffolds were used, so as to avoid the creation of magnetic fields. 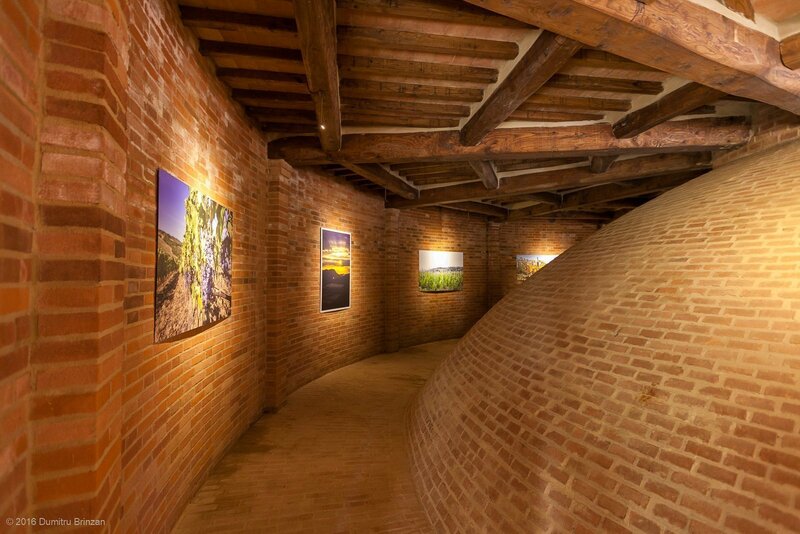 Over 12 years to build a cellar using the Golden Ratio with only bricks and mortar – this is true dedication. 12. 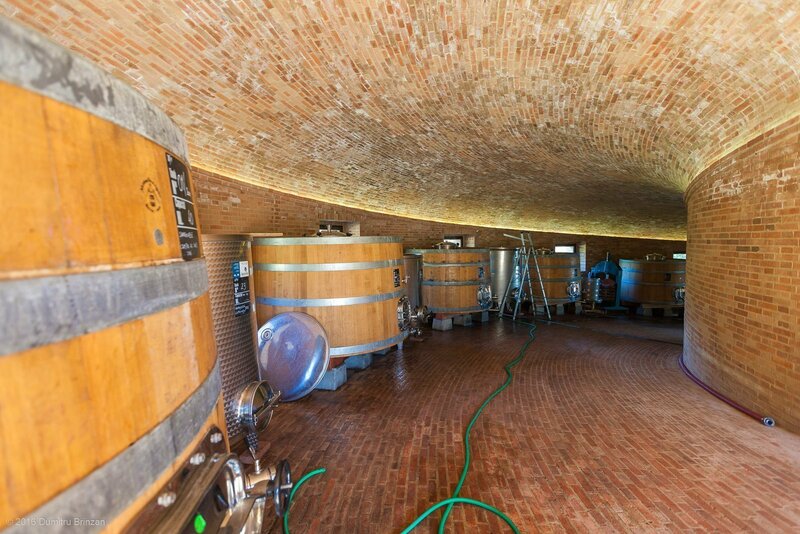 At the top of the cellar the temperature is higher, so this is where fermentation generally takes place. 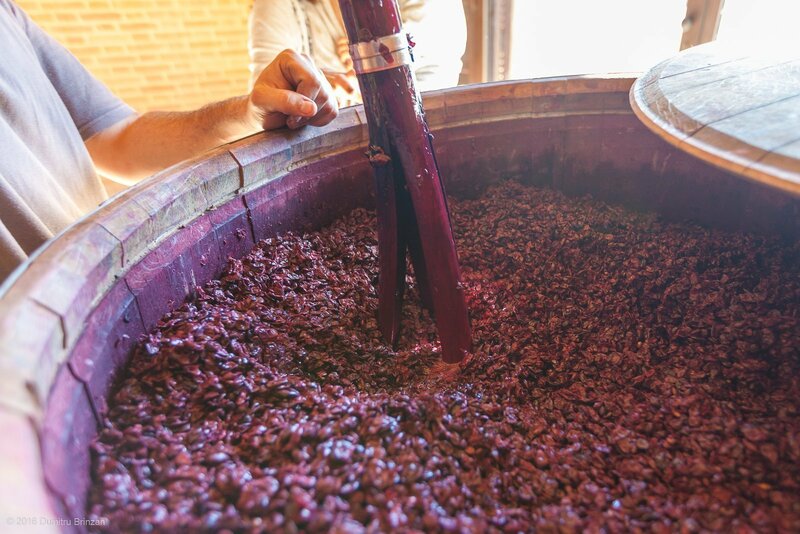 We arrived in mid-October when new wine was already in production. Unfortunately we were too late to try just the grapes. 13. Looks like a broom used for Quidditch in Harry Potter. 14. 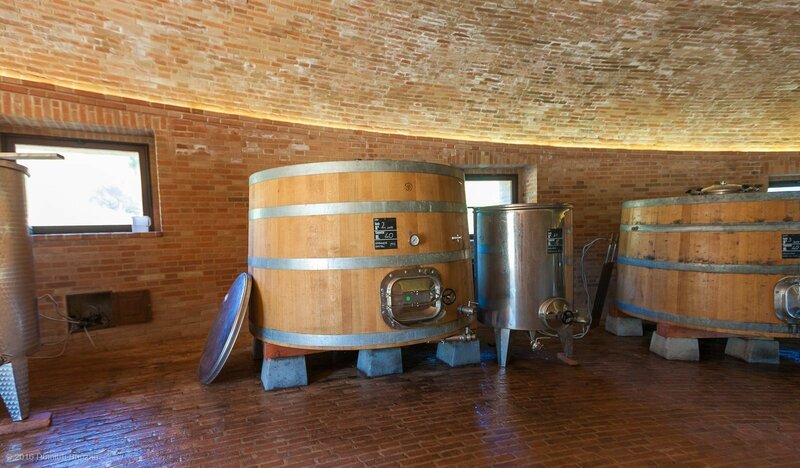 Oak vats with a capacity of 40 hectolitres each (~5,000 bottles). 15. Somewhere at the top we see this round room used to display some photos from the area. 16. Do you want to guess what’s with the round thing? 17. These 3 barrels contain the new 2016 vintage of Bonsai wine. 18. 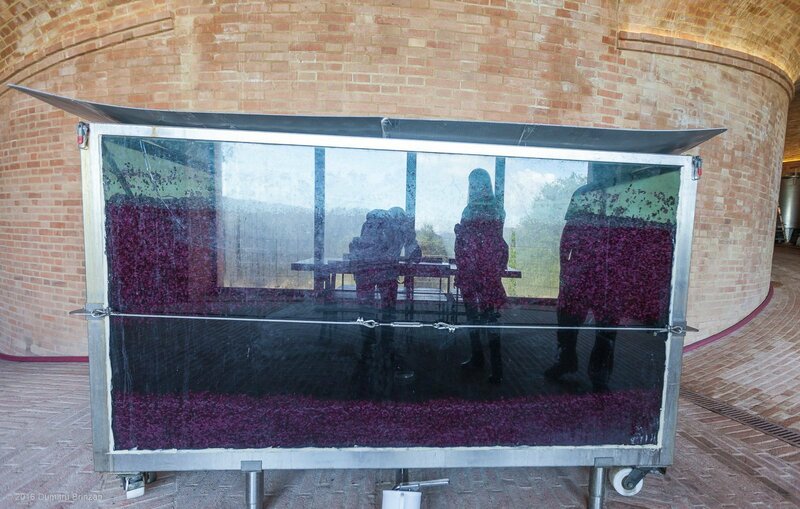 A glass tank to show what happens to the grapes during fermentation. The one that are done fall to the bottom, the ones that are still “alive” stay on top. 19. 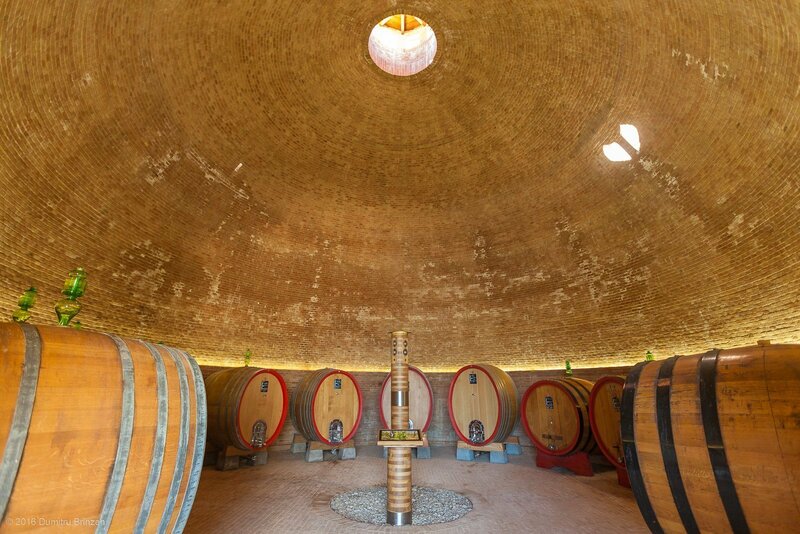 One such barrel holds 5 hectolitres of wine. 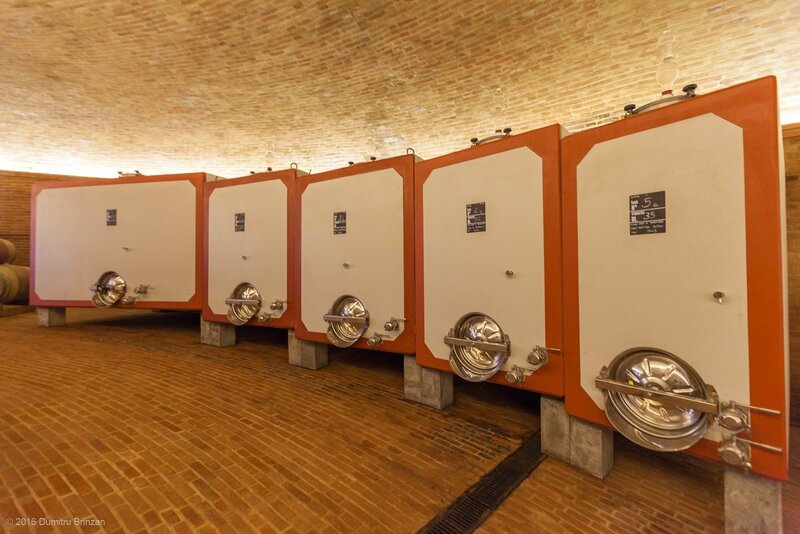 1 hectolitre is equal to 125 0.75l bottles of wine. Below you will find the price for a single bottle, just hold on to your seat. 21. This is a concrete tank with a capacity of 120 hectolitres. 120 * 125 = 15,000 bottles. 22. 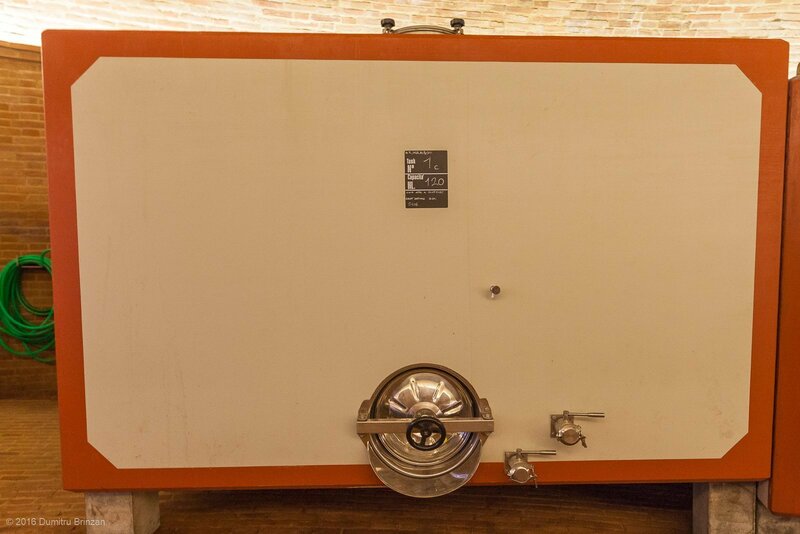 There are a total of 5 custom-made concrete tanks of different capacity. 23. And finally we reach The Pantheon. You saw the roof of it in photos number 15-16. 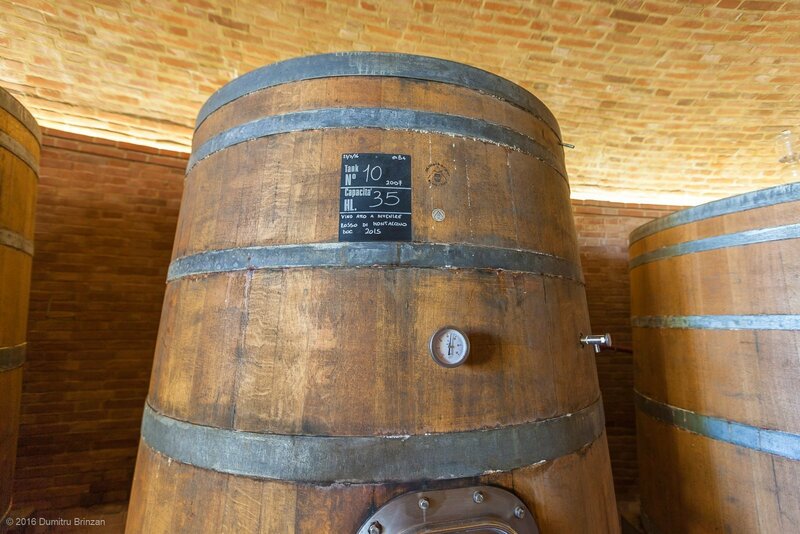 The main wine ageing process takes place here, in oak casks with a capacity of ~24 hectolitres each. In the middle there’s a special speakers station where gentle music is played for the wine every day, from 21:00 to 09:00 (if I’m not mistaken). 24. Simone the cellar-keeper does the tour of the place. 25. Bottles are ready to be labeled according to the country of destination. 26. 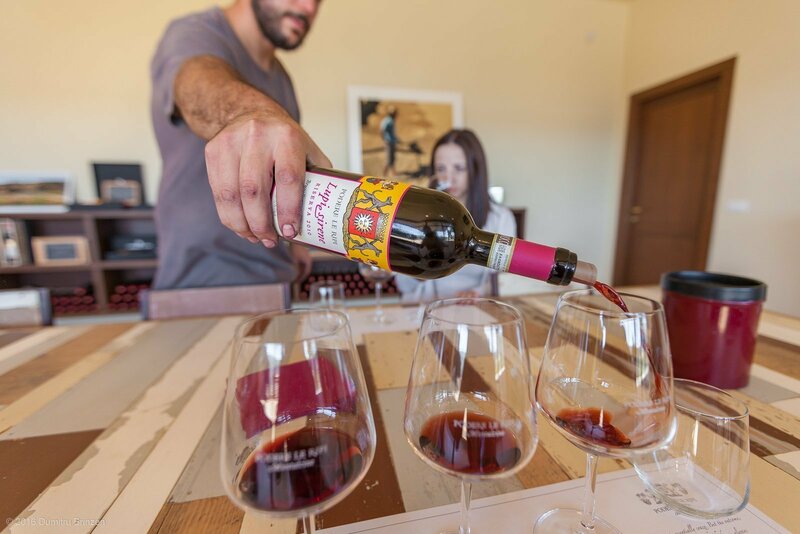 We are back to the tasting room to finally try some of the wine. 27. How much is a bottle of Bonsai wine? 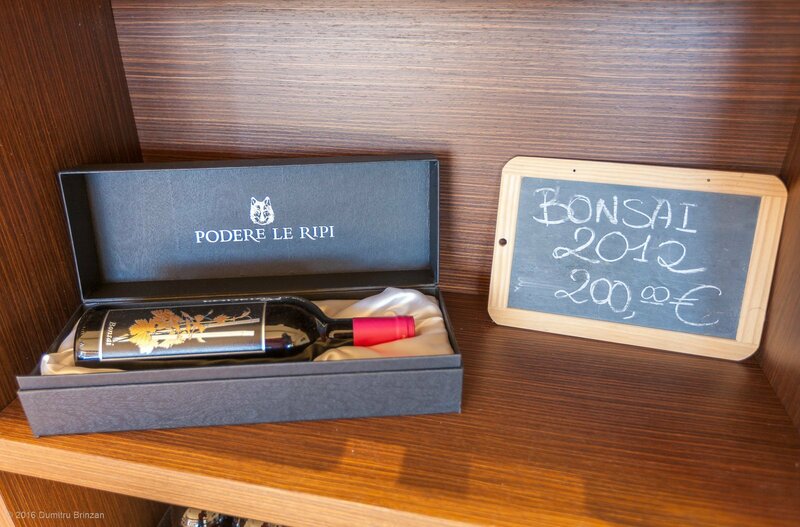 Just 200 EUR per bottle. 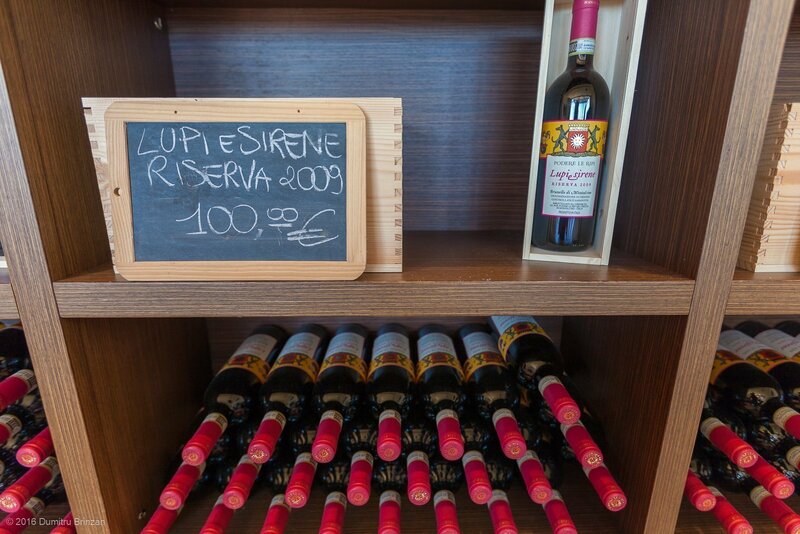 There are only very small quantities of it each year and Francesco the owner drinks a portion of them, so even less is available for sale. 28. Lupi e Sirene Riserva 2009 – 100 EUR. 29. 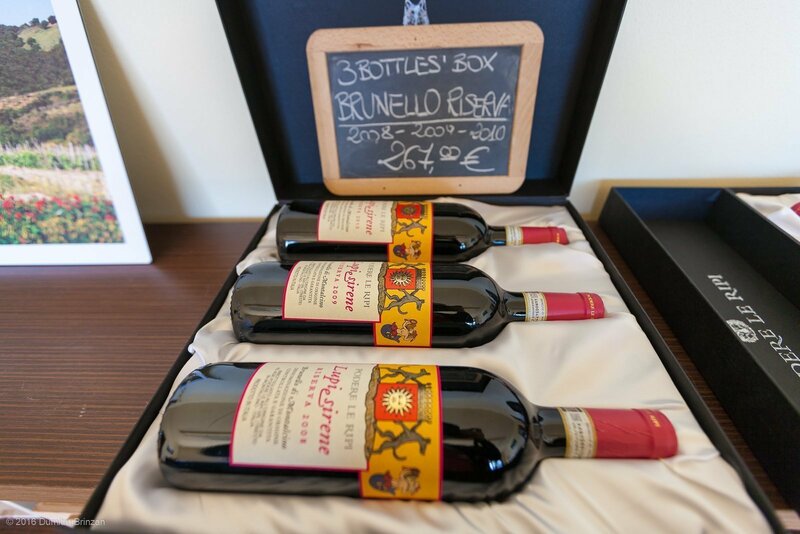 A nice set of Brunello Riserva 2008-2009-2010 will cost you 267 EUR. 30. Fans of Brunello/Sangiovese will not feel disappointed. 32. The viewing point in front of the tasting room has some good views. 33. A 70-200mm lens helps us pick out some details. 34. A final look at this masterpiece on our way out. 35. The road back makes you stop at every corner. 36. Everywhere you look is just like one big postcard for Tuscany. 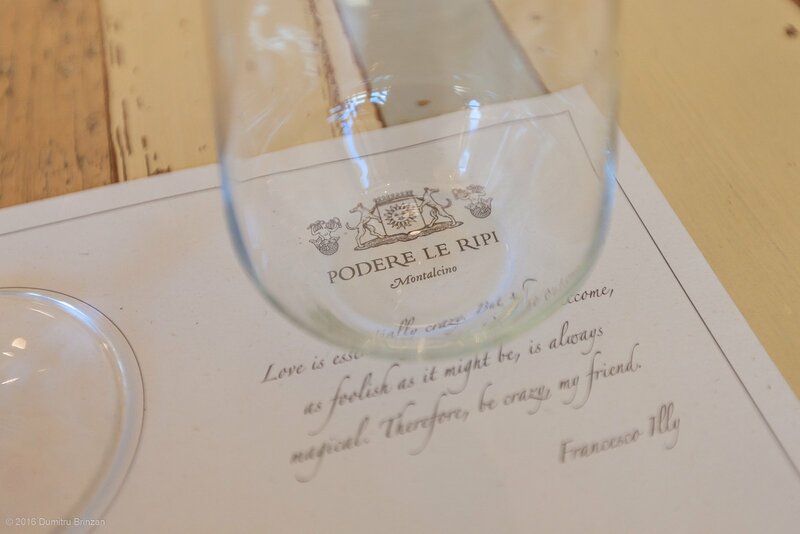 Podere le Ripi is the winery that was finally able to entice and entertain us with a very good story. 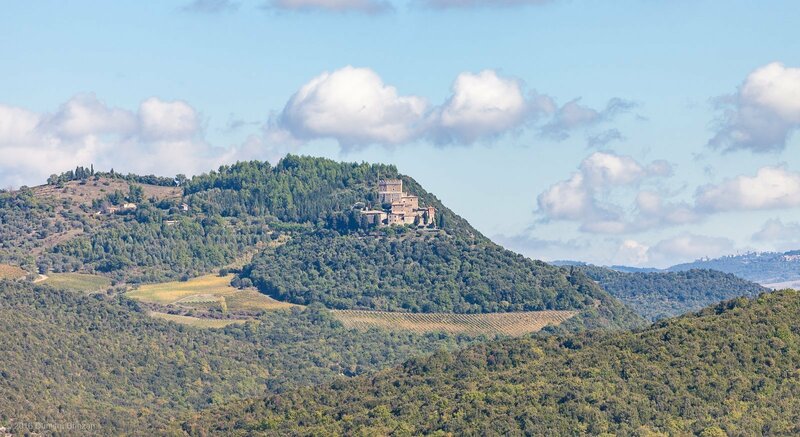 This place will be interesting for most: casual tourists, wine enthusiasts, winemakers, etc. 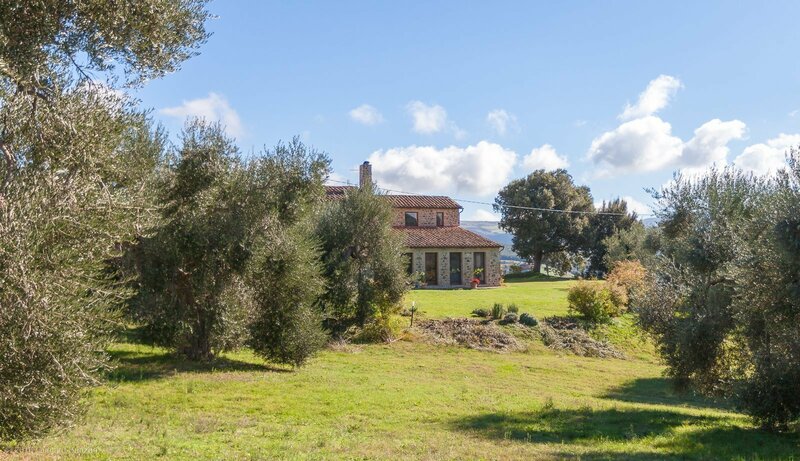 Make sure to visit it on your next trip to Tuscany. These photos were taken on 16th of October 2016. My wife and I visited three weeks before you. We had some of the 2012 Bonsai wine shipped home to Canada. It should be ready to drink in 2021! 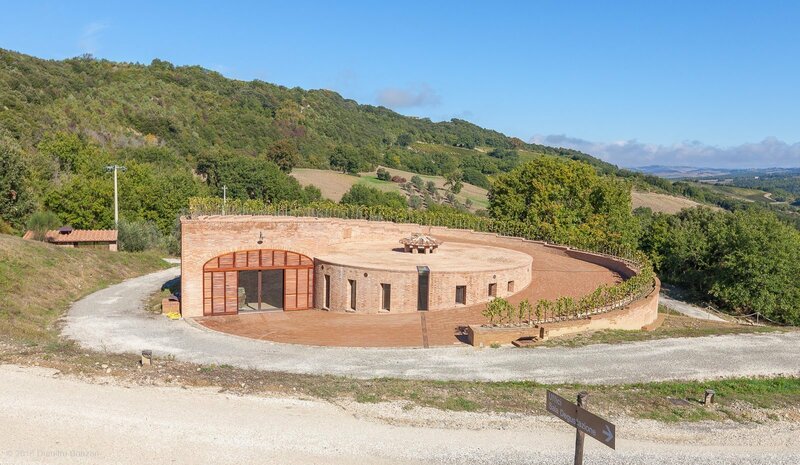 Great photos of an amazing and unique winery. Have you tasted it on-site, how was it?